The boys soccer program is a fall sport starting in August going to mid-October. 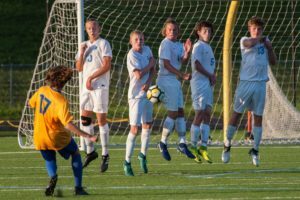 The boys soccer program is comprised of 4 teams each season (9A, B-Squad, JV and Varsity). During the season they have practices Monday thru Friday, when they don’t have games. Plus, for home games they prepare by having team pasta dinners! The 2016 soccer team had a very successful season in the Metro West Conference with a record of 13-3-2. For more information visit the Jefferson boys soccer website.